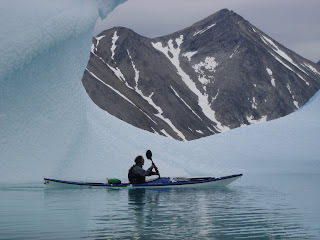 seakayakadventures.co.uk: Returning Greenland Expeditions 2011. Well what a fantastic summer we had in Greenland – the ice this year was so thick it was initially like paddling in the Antarctic. A huge belt of polar ice had drifted down the east coast and just as we arrived was blown into the fjord system, blocking Tasiilaq harbour for 5 days, which prevented the local supply boat and hunters from travelling. All the settlements were completely cut off and several other groups were stranded missing flights and boat connections. Fortunately I managed to get us all on the last boat from Kulusuk to Tasiilaq and we eventually arrived in the harbour at 2.30 in the morning, having spent 6 hours battling the ice. I knew the ice conditions could change rapidly, however after several days wait we were contemplating having to switch to a hiking trip. Our patience was finally rewarded and we escaped from the fjord one very misty day, paddling through thick ice in the fog to establish our first proper camp of the journey at an old Inuit Whaling site. It can always be a problem when you have a keen group who are new to the area as their initial inexperience tempts them to paddle when I might consider conditions to be unsuitable – on this trip however, it was very obvious which days would be spent exploring on land. Every one was very aware of this and happy to be seeing it in such amazing conditions. Progress however was made and we had a great time exploring several areas I had previously been unable to visit and we always found enough drift wood to have a fine camp fire and enjoyed a wee dram at the end of the day. It was not possible to return to Tasiilaq as planned – infact the last couple of days were a struggle just getting back to Kulusuk in time for the flights home and on one occasion we all had to get out and drag our kayaks over several large flat pans of ice, jumping the gaps and continuing to the edge and open water. I get weather updates through my Sat phone and knew we were in for a big blow – this came as expected and we just made it to a great hut in time to spend the next 2 days reading and festering in its relative comfort, as a full gale ragged outside. I was paranoid that although lashed down the kayaks would be blown away – on inspection they were so full of rain water I knew they were not going anywhere and so was able to relax until it was time to move on. A great paddle though the channel of Ikasak, which was almost impassable with ice brought us back out to Ege in the Ammassalik Fjord. Conditions and the weather continued to steadily improve as we started to make our way back to Tasiilaq. We had experienced it all – impassable ice, thick ice, sun, rain, gales, mirror calm conditions, crystal clear waters and some fantastic wilderness campsites. After everyone had returned home I serviced all the kayaks and equipment, ready for 2012 and then spent some time working with local Greenlandic people from Tasiilaq who were keen to experience some kayaking.